The Princess of the Vers Empire. She is very close to Slaine. She went to Earth on a goodwill visit, but her motorcade was attacked and she was presumed to have died. This assassination was used by the orbiting Martians as a casus belli for their invasion. However, the princess was ill that day and the person who died was a body double. 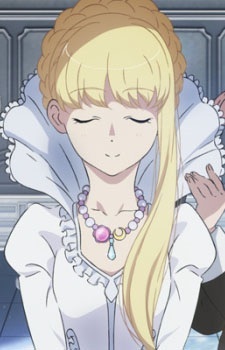 Asseylum now travels with Inaho's group under a false identity until they can get a message back to her grandfather in hopes of stopping the rekindled war. Asseylum is an idealist and pacifist. She believes in peaceful solutions and she sees the people of the Earth in a good light. Unlike many of the Martians shown so far, she seems to treat the people of Earth as equal humans. Asseylum appears to be regretful of the actions that led to the Second Earth-Mars War between the Martians and the people of Earth, yet she feels that she has the responsibility to help stop the war. Asseylum is kind, caring, and compassionate, however she is also naive, believing that if her grandfather found out that she were still alive, that the war would end. Asseylum later realizes her naivety, and that certain people of VERS were only using her as an excuse to start a war with Earth. Asseylum seems to also have a bold and decisive side, she is not particularly guarded around others being quickly open and friendly. Asseylum seems to prioritize the safety of others over herself, and takes her position as the Princess of VERS seriously. In episode 12, she is shot in the head by Saazbaum, who then reveals his motives for wanting to kill Asseylum. After Saazbaum succumbs to his wounds, and the unknown status of Inaho after being shot in the head by Slaine; Princess Asseylum is found to be missing in action. 19 months later, she is being kept in stasis on the moon while in a coma in order to recover. Slaine often visits to see if she's awoken or still sleeping. In episode 7 of the second cour (or Episode 19), she wakes up from her coma, but her recovery is unknown to everyone but Slaine and Eddelrittuo. In the process, she has lost her memory and has to be kept in a wheelchair, but starts remembering things slowly through different things (such as Inaho while watching birds.) However, in the next episode, she completely remembers everything after receiving Slaine's pendant from Eddelrittuo. In episode 11 of the second season, she gets married to Count Chruteo.